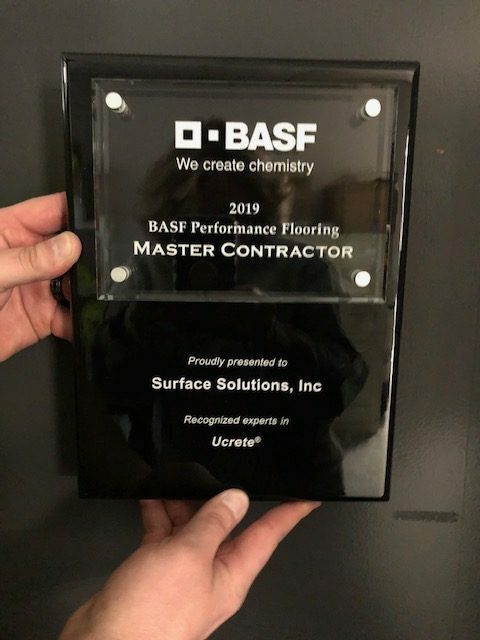 For eight consecutive years, Surface Solutions, Inc. (SSI), chosen by chemical company BASF as an approved contractor for BASF commercial and industrial flooring systems including Ucrete® and MasterTop® solutions, has also met the qualifying criteria to be awarded BASF Performance Flooring Master Contractor status for 2019. The BASF Performance Flooring Master Contractor program is limited to the best installers in the industry who consistently provide their customers with optimal resinous flooring solutions and quality service, in partnership with BASF. It is a significant accomplishment to reach this status and contractors must qualify every year to retain it. Amy D. Manghelli, SSI president, tells us more about the significance of master contractor status and what it means for her customers. How has SSI maintained Master Contractor status for eight years straight? The number one criteria is superb workmanship in the field applying all Ucrete systems. 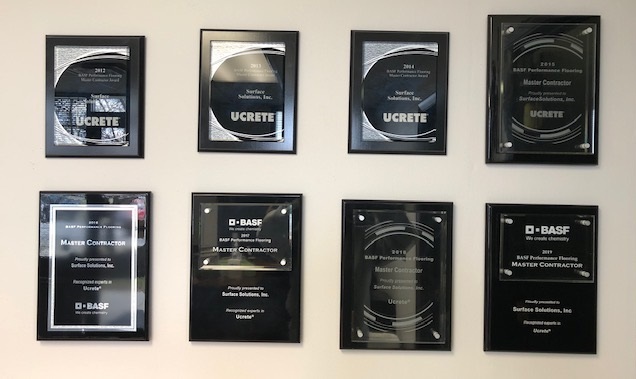 This is due in part to being able to work with excellent Ucrete materials coupled with SSI’s highly qualified, experienced crews and team leadership. We also exceed in financial qualifications as well as purchasing requirements. What are the biggest benefits for your customers? A potential customer may not have heard a lot about SSI, but most know BASF, a world-renowned company that puts its faith and trust in us. We install BASF product to their specification and with great end results. Our current customers -and their facilities- benefit most from our partnership. If BASF can put its trust in SSI, shouldn’t our potential customers trust us, too? Women are making an impacts in a variety of business sectors – and that benefits all business in a positive way. Recognized as a top BASF Performance Flooring Master Contractor since 2012, recognized as experts in Ucrete® and MasterTop® solutions, Surface Solutions, Inc. is a women-owned independent industrial floor contractor specializing in seamless, polymer flooring systems utilizing the most trusted brands in the industry. As a Flowcrete STAR Contractor, Surface Solutions, Inc. is a leading provider of industrial flooring solutions for the Food & Beverage industry. From testing to consultation and complete installation services, Surface Solutions is your premier source of non-toxic, safe and environmentally friendly flooring systems, offering turnkey installations using only in-house personnel. All installations come with a complete single source warranty. To learn more about how Surface Solutions can help provide the highest quality industrial flooring solutions for your business, contact us today!